You Can Come Out Now! So we’ve past the 37 week mark and I have high hopes that our little bundle will arrive just a little early. I would hate for it to have to share a birthday with Christmas. It sounds romantic, but seems wildly unfair in the long run. Ask anyone who has a birthday around Christmas, and they’ll roll their eyes and tell you how it always gets lost in the shuffle. Heck, my birthday is a month afterwards and it always feels like a bit of a holiday after thought. So, I hope the baby is a little early. We’re as ready as we can be for it, and I’m super excited to not have to wear these ill-fitting maternity clothes anymore. I started the blanket a few weeks ago. It’s 4 skeins of Elsebeth Lavold Silky Wool, and one skein of Brooklyn Tweed Loft in Woodsmoke which were both hanging out in my stash. 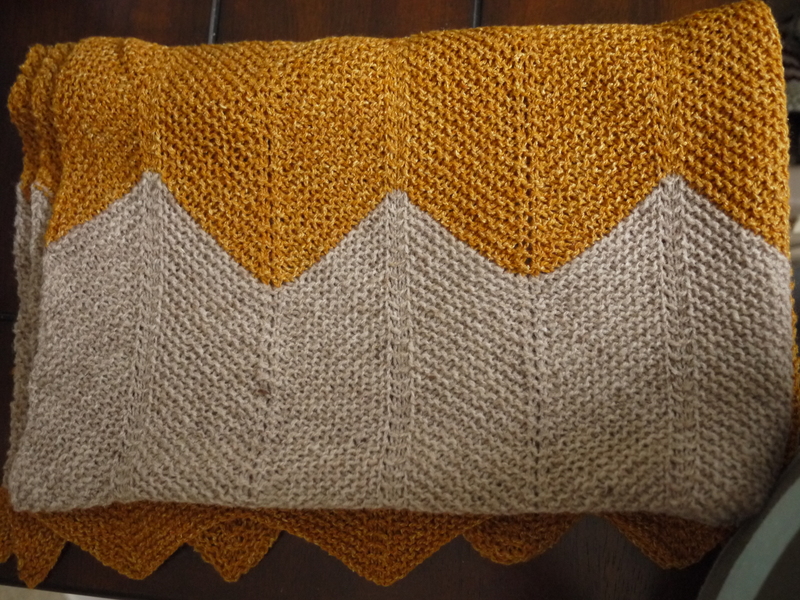 I modified the stitch from this pattern, and I’m really happy with the result. I’ve been a big fan of color blocking (if you couldn’t tell from checking out my store) lately, so I’m happy to bring a bit of it into our home for the new one. The sweater is a pattern from More Last Minute Knitted Gifts, and is made from Wool of the Andes worsted in Dove Grey and Garnet Heather. I like that it’s a little reminiscent of a candy cane, but will still look nice throughout the winter. 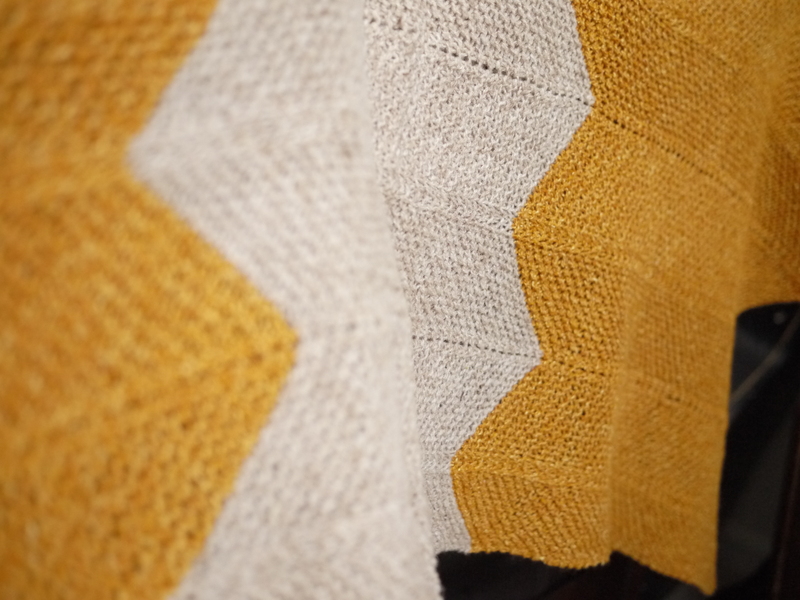 While I love this pattern (it’s knit flat and then seamed at the end) I would definitely not recommend making this pattern in stripes. You end up with lots of ends to tuck in from having to break and rejoin the yarn in different spots. 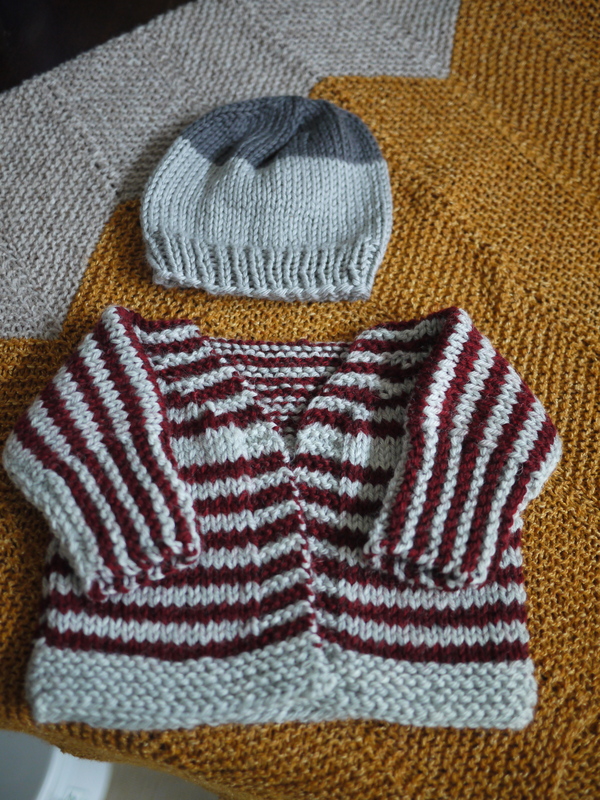 I am happy that I managed to match up the stripes while seaming. That larger stripe across the chest was intentional. I may still add a single crochet border around the front opening and neck, but I will probably skip the buttons. I made one for the Bear and never put buttons on it either. 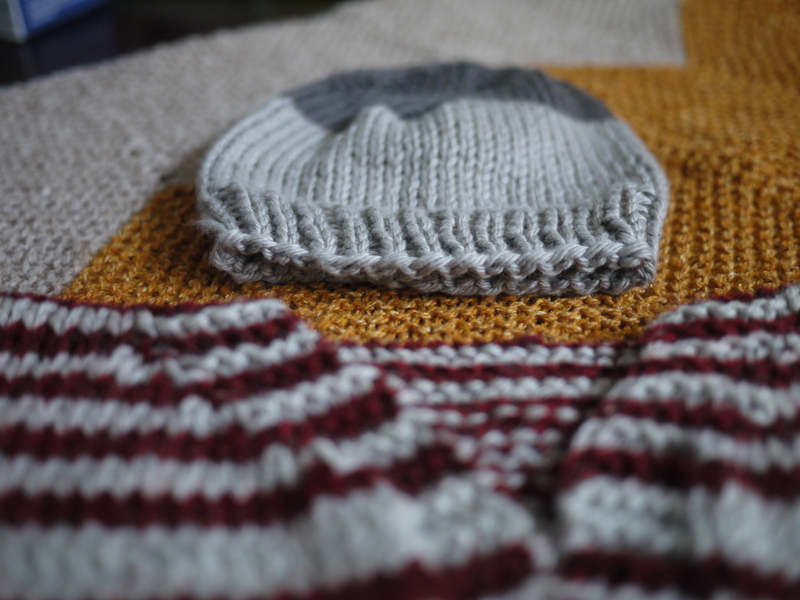 The hat is a slightly modified version of this hat from Last Minute Knitted Gifts. It’s made of Knit Picks Comfy in Dove and Hawk. I wanted something soft for the little one’s head, and this stuff is super soft, with a little bit of acrylic to keep it’s shape. I hope it fits! I love little babies in hand knits. It was important to me to make new things for the baby instead of just letting him or her use the things I made for the Bear. I want them to be able to have their own things that they’ll hopefully pass on through their families some day. PS. 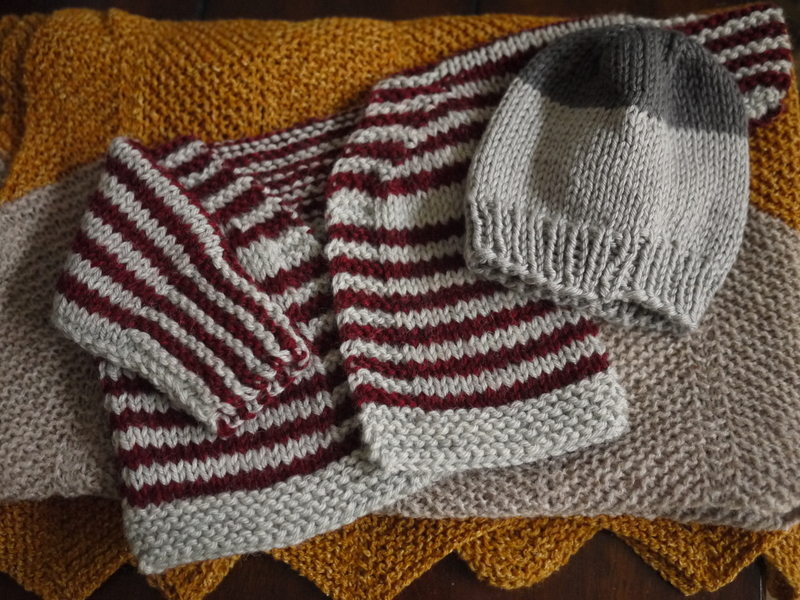 I haven’t had a chance to Ravel these yet, but if you’re on Ravelry, Let’s be friends! When you have to move every few years, you develop a tendency to try and simplify as much as you can. 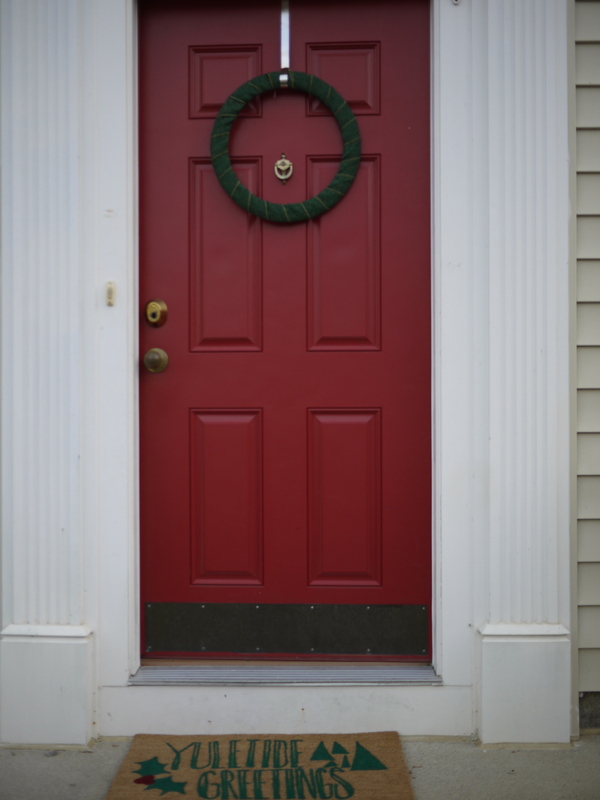 For DIY folks like us who have a million hobbies this can be a pretty tall order, but one way in which we keep things simple is our Christmas decorations. Like I’ve mentioned before, for us, the holidays are a lot more about being together and eating delicious food, than having a Clark Griswold style blowout. 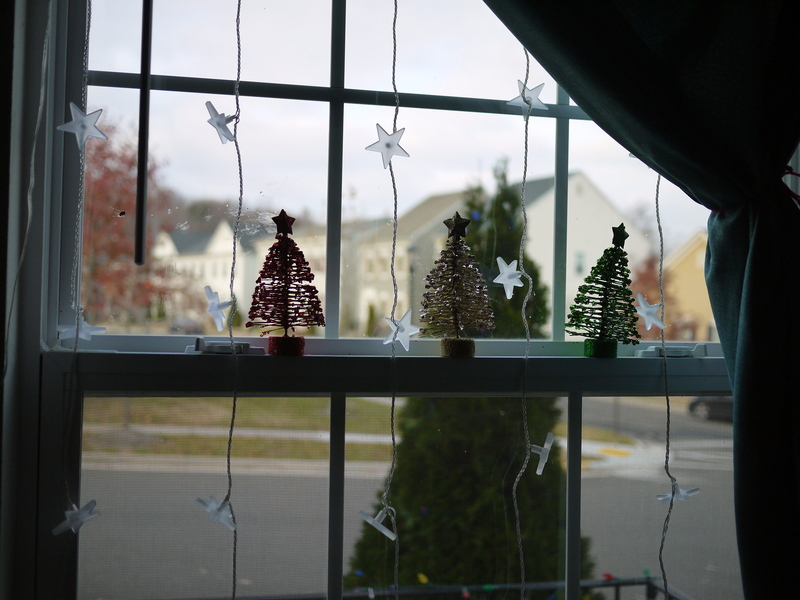 Sure, I’d love to have a huge tree glittering with vintage glass and lights and garlands in every room of the house. But then I think about having to pack those up, haul them around, and then deal with the inevitable disappointment when things get broken by the movers, I’m glad we keep things small scale. 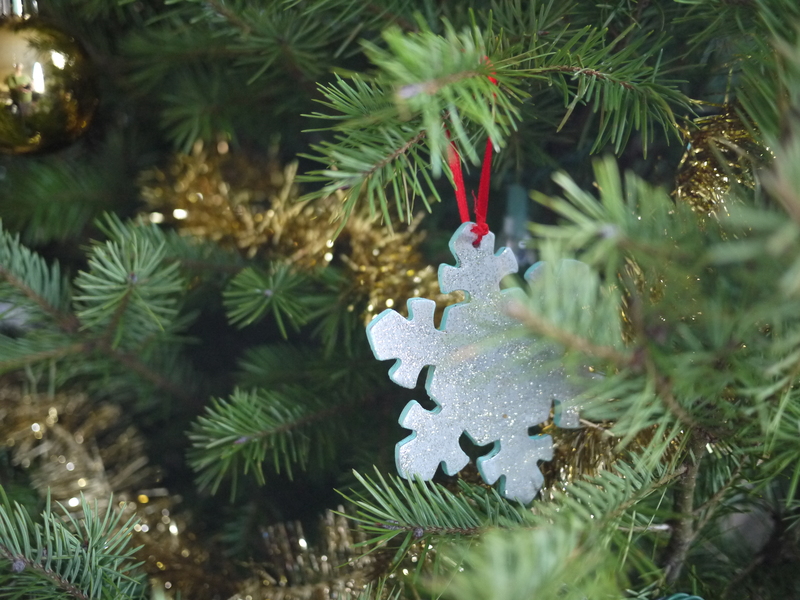 Plus, you never know what your new place will look like and how you’ll lay out everything, so it’s best to stick to a couple boxes of lights, ornaments, and DIY snow globes. 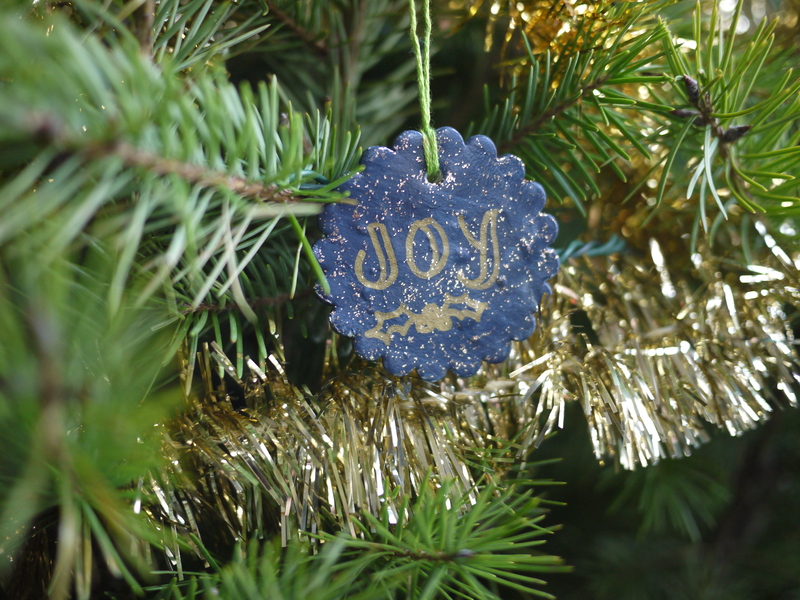 We get a smaller tree, we make a few new ornaments for it each year, and at night we turn it on and enjoy its soft glow while we eat some homemade cookies and talk about the day when we can settle down into a place of our own and really start to branch out. I imagine that I’m probably not the only one who received their holiday issue of Martha Stewart Living in the mail and immediately sat down and examined each page, carefully noting which type of crafty holiday project and recipe would adorn their house this Christmas. I liked all the projects using felt, but I was particularly interested in the upcycled mason jars turned snow globes. 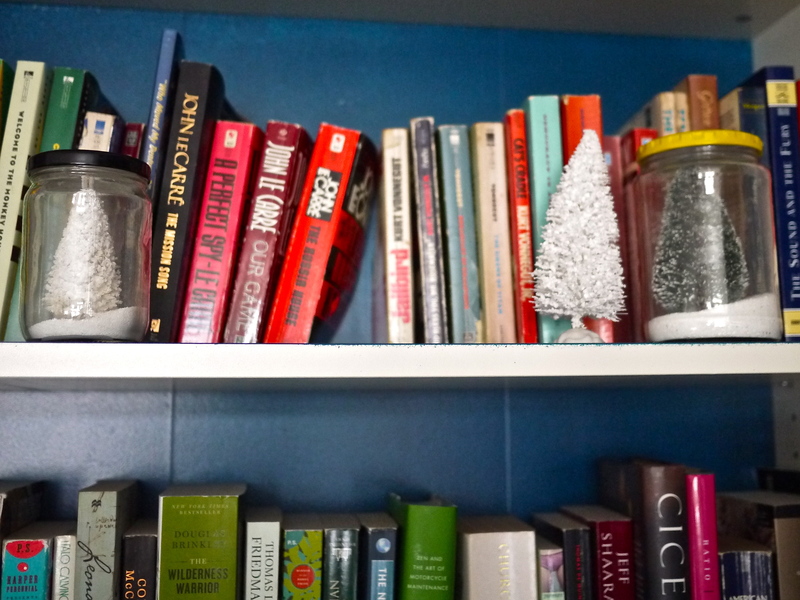 It seems these little snowy dioramas are all the rage this year as several other tutorials began popping up in my Pinterest feed as well.I decided to keep my own snow globe project very simple (read: inexpensive), and relatively unadorned. Below is a quick and dirty tutorial should you also find yourself short on time and wanting some snowy cheer in your home. Using glass jars I’d been keeping around for such an occasion I went out and picked up two packages of bottle brush trees, some white sand (from the floral section of the craft store), and tacky glue. I stripped the labels off the bottles using olive oil and had DB spray paint the lids. Once everything was clean and I dry I put a generous helping of glue on the base of each tree and placed them in the jars using some chopsticks. I let these dry overnight then added some sand to each one and topped them off with the red lids. I’ve made 8 so far, with enough trees and sand for several more. 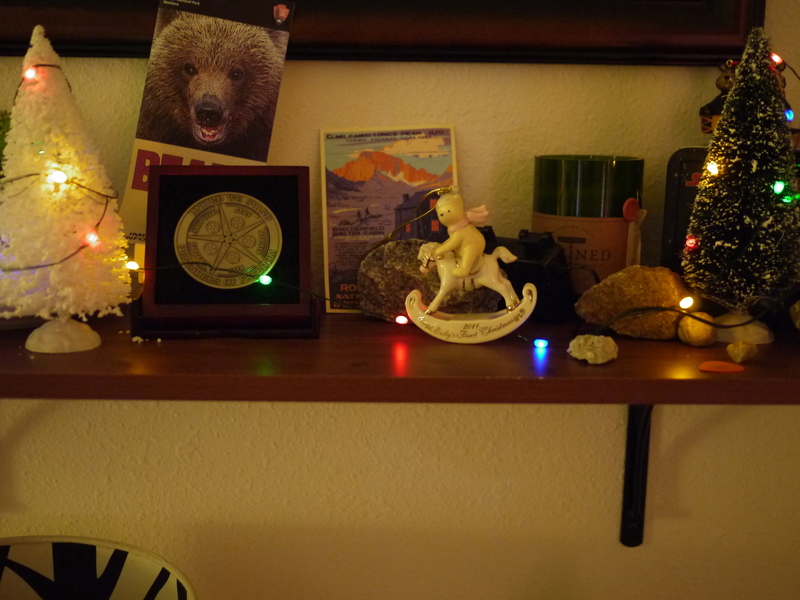 They’re fun to stick all over the house, such as on top of our modest collection of vintage books. PS. The above photo was taken with my iPhone and edited using the Afterglow app, which is a great app that I highly recommend you download.